Guglielmo Weber Professor of Econometrics, University of Padua. 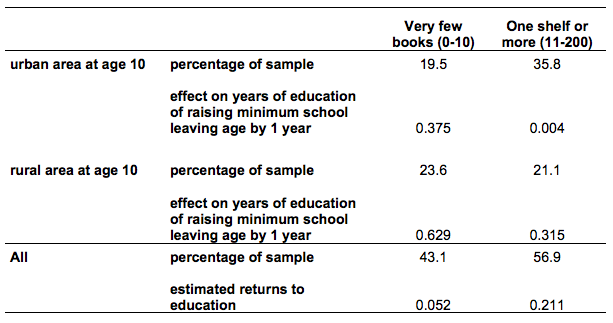 At least since Mincer (1974), many economists have estimated the returns to education. The vast and ever growing literature in this area has been reviewed by Card (2001) and Heckman et al. (2006). Some people benefit more from schooling than others. For instance, Cunha and Heckman (2007) argue that the returns to college in the US are lower for individuals who grew up in disadvantaged households. But the returns to education are only 5% for the sizeable fraction (40%) of men brought up in households with less than a shelf of (non-school) books, compared with 21% for the luckier ones who had access to more books at home. In our analysis, we estimate the effect of education on lifetime earnings rather than current earnings. Previous research shows that the returns to education based on current earnings can be significantly biased when compared with those based on lifetime earnings, particularly if the sample includes many older workers (Haider and Solon 2006, Bhuller et al. 2011). We find that one additional year of education increases the average lifetime earnings of Europeans aged 60 and over by 9%. We distinguish between individuals who had access to many or few books at age 10. A sizeable fraction (40%) of Europeans aged 60 and over grew up in a household with less than a shelf of (non-school) books (a shelf corresponds to 10 books). The returns to education are only 5% for individuals brought up in such households, compared with 21% for those with more books at home during childhood. Since 43% of this cohort grew up in rural areas, and compulsory school reforms had a stronger effect in such areas, we also distinguish between rural and urban boys. The reason why compulsory school reforms are important for our analysis is that education is a choice variable – more able boys (and girls) are more likely to attain a higher level of education. A straight comparison of earnings by educational attainment confounds the effects of ability and education. A more informative comparison focuses on individuals who are very similar but are exposed to different minimum school-leaving ages, due to changes in compulsory schooling reforms. This is the reason why previous research has relied on compulsory school reforms to identify the causal effect of years of education on earnings (Acemoglu and Angrist 2001, Pischke and Wachter 2005, Oreopoulos 2006). We use a sequence of school reforms that raised the minimum school leaving age in Europe for individuals born between 1920 and 1956. School reforms were particularly effective in increasing average educational attainment in rural areas, which indicates that the direct and indirect costs of attending school were higher for children living on farms or remote agricultural villages. Why did books at home matter so much for the returns to education? “The books transported her into new worlds and introduced her to amazing people who lived exciting lives. […] Matilda’s strong young mind continued to grow, nurtured by the voices of all those authors who had sent their books out into the world like ships on the sea”. Although the data do not reveal whether books were read, and how many, it seems likely that there is a positive relationship between the number of books at home and a child’s reading activities. Alternatively, books at home matter for earnings because they capture the effects of early socio-economic conditions. Unsurprisingly, households where the main breadwinner was in a white-collar occupation were more likely to have at least a shelf of books, both in rural and in urban areas. At the same time, however, 45% of rural boys with a blue-collar parent (and 58% of urban boys with a blue-collar parent) had at least a shelf of books at home. This suggests that books indicate not only differences in parental occupation, but also the cultural background of the household and its likely effect on the development of cognitive skills. Why did individuals from rural areas with many books at home need compulsory school reforms to collect the high returns associated with additional education? Why did boys in rural areas not invest in their education even in the absence of changes in the minimum school leaving age? Perhaps because people living in rural areas were much more isolated than nowadays, and chose education based on perceived rather than actual returns. High paying jobs were located in cities but rural boys lived in communities where few adults had information on urban jobs. Perceived returns may have been much lower than actual returns, especially if productivity growth in urban jobs was underestimated. In fact, not all people born in rural areas around WWII could foresee the important, long-lasting positive macroeconomic shock of the post-war period, as well as the increasing skill premia – especially if they were basing their expectations on the experience of the post-WWI period. We document that rural boys with books were more likely to move to the cities than those without books (46% versus 33%) and to have had their first job be a white-collar job (33% versus 15%). While growing up in rural homes with books, they may not have realised how high the marginal return to education could be. But once the reforms forced them to remain at school until a later age, they reaped the benefits of their education by moving into fast-growing urban areas. The different migration pattern of rural boys into cities may very well be the key to understanding the massive difference in returns to education. For children with books, the more cultured environment they grew up in made them more willing to take a chance and move to the city. Boys who grew up in a less cultured home, instead, went back to the countryside and to the standard farming jobs available there, and failed to make the most of their extra education. We have seen that education reforms that increased the minimum school leaving age were beneficial to some, but not all boys that were potentially affected by them. In fact, a specific group of individuals – those who lived in rural areas and had very few books at home – attained higher education because of compulsory school reforms but experienced much lower private returns. This suggests that alternative education policies, targeted at reducing the marginal cost of education – such as education vouchers – might have been a more efficient way of increasing the education of individuals with potentially high returns. Yet this view fails to consider that education has both private and social returns. If additional education has substantial positive externalities – either because it reduces crime rates or because of productivity spillovers – these social returns may more than compensate the low private returns obtained by those with few books at home. Given that today people have more books at home than in the sample studied in this article, we may also wonder whether the results would still hold for more recent cohorts. This is a difficult question and we offer here two speculative remarks. First, the comparison can also be framed as the comparison of individuals with fewer than the median and more than the median number of books. Even if the median number of books rises over time, because the requirements of modern societies increase, we could still find that those with fewer than the median number of books earn lower returns from their education than those with more books at home during childhood. Second, since compulsory school reforms have been less effective in urban areas, where most children already attended school past the minimum legal requirement prior to the reforms, and since the urbanisation process has completed its course in most developed countries, we expect that the effectiveness of these reforms may be much smaller now. Yet, they may still have an important role in modern deprived urban ghettos. Acemoglu, D and J Angrist (2001) “How large are human capital externalities? Evidence from compulsory schooling laws”, in B S Bernanke and K Rogoff (eds), NBER Macroeconomics Annual 2000, Cambridge, MA: National Bureau of Economic Research, 15: 9–59. Bhuller, M, M Mogstad and K G Salvanes (2011) “Life-cycle bias and the returns to schooling in current and lifetime earnings”, Discussion Paper No 5788, IZA. Brunello, G, G Weber and C T Weiss (2016) “Books are forever: Early life conditions, education and lifetime earnings in Europe”, Economic Journal, forthcoming. Card, D (1999) “The causal effect of education on earnings”, in O C Ashenfelter and D Card (eds),Handbook of Labor Economics, Amsterdam: Elsevier, 3A: 1801–63. Cunha, F and J J Heckman (2007) “The technology of skill formation”, American Economic Review, 97(2): 31–47. Haider, S and G Solon (2006) “Life cycle variation in the association between current and lifetime earnings”, American Economic Review, 96(4): 1308–20. Heckman, J J, L J Lochner and P E Todd (2006) “Earnings functions, rates of return and treatment effects: The Mincer equation and beyond” in E Hanushek and F Welch (eds), Handbook of the Economics of Education, Amsterdam: Elsevier, 1: 307–458. Mincer, J A (1974) Schooling, experience, and earnings, New York: National Bureau of Economic Research, Columbia University Press. Oreopoulos, P (2006) “Estimating average and local average treatment effects of education when compulsory schooling laws really matter”, American Economic Review, 96(1): 152–75. Pischke, J–S and T von Wachter (2005) “Zero returns to compulsory schooling in Germany: Evidence and interpretation” NBER, Working Paper No 11414. Guglielmo Weber, Professor of Econometrics, University of Padua.